The poetry of the ‘forties has now been reappraised with almost as much vigour as that with which it was earlier despised; in the process “critical” generalisations and stereotypes have been deconstructed or discredited, and its real breadth has been rediscovered. Some of it has even been read again. But there are limits. I mean, nobody actually still reads the core New Apocalyptics, J F Hendry and Henry Treece, do they? Wartime anarchist Henry Treece adopts an Apocalyptic expression. 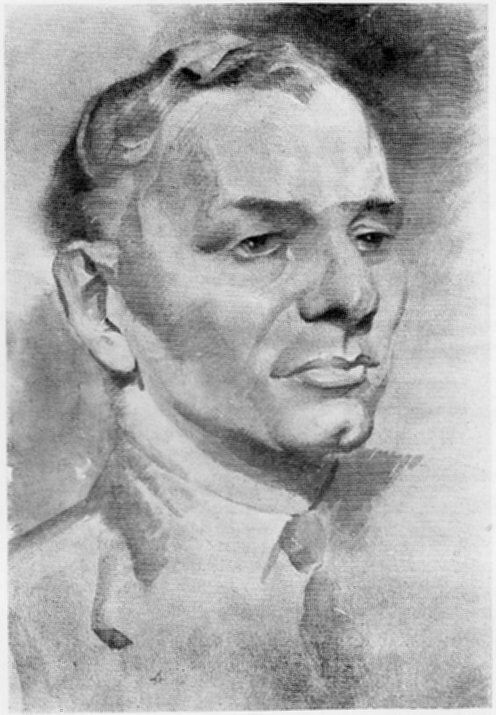 Portrait by David Kemp from Treece's 'How I See Apocalypse', 1946. The Apocalyptics are interesting today maybe less for their poems than for their theorising on the zeitgeist. And they certainly could theorise! Though one does wonder what Apocalypticism, Personalism and so forth ever really were in practice, that is, beyond their own manifestos about themselves. Was there any substance at all beyond the texts? Comfort notes that Treece’s theorising (as opposed to his impulses or background) is the real basis of his poetical rhetoric, and damns “his tendency to write theoretical expositions of what he is doing”. And it does often seem that Treece was temperamentally incapable of having a conversation or writing a poem without also producing, in parallel, some sort of theoretical self-commentary in essayese in which he would announce the event to an expectant and grateful reading public. As an ex-Marxist (of sorts), Treece understood perfectly well the proper relation between theory and practice (“as closely connected as … thought and deed”). But it seems that he only understood this in theory. 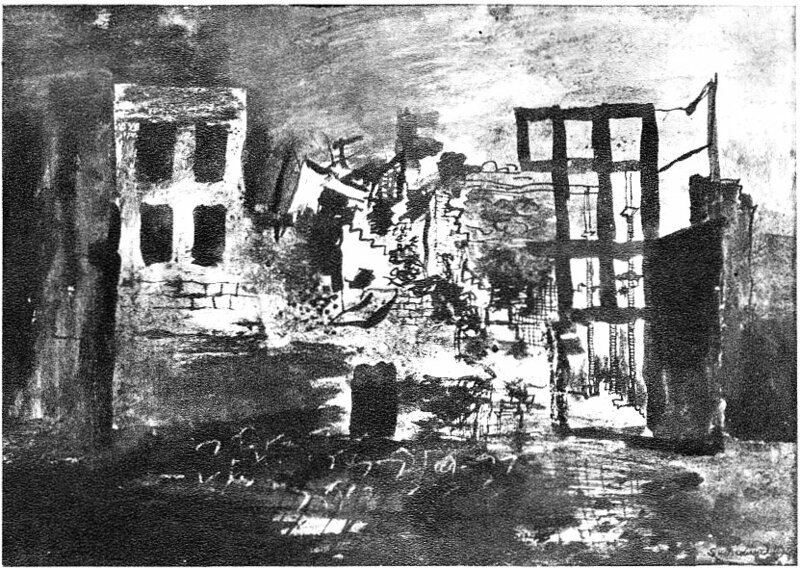 But on the plus side, all this pontification in print has at least left us some evidence of the impact of anarchism on the chattering classes of the war years, which seems to have been more considerable than has sometimes been recognised. (This evidence also serves to demonstrate the weakness of anarchism when it is left to float around literary circles as a set of ideas, disconnected from any class basis in organised labour.) Not that you would know about any of this from the literary historians. For instance, Linda M Shires, in the Apocalypse chapter of her lacklustre 1985 essay collection on British Poetry of the Second World War, omits strikingly even a single mention of anarchism. 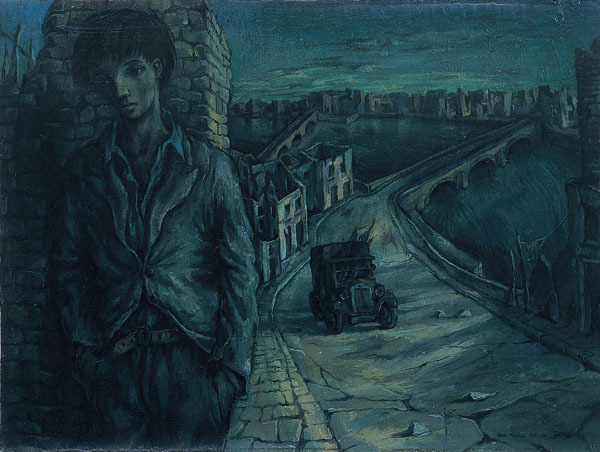 But for Treece and others, under the influence of Herbert Read and seeking a progressive alternative to the leftovers of Auden and Stalinism, it was a vital strand of their thinking. “The only way Left, as I see it,” wrote Treece, “is that of anarchism”. I gradually came to see that my “Communism” was nothing more than my adolescent sense of injustice, operating in terms of the only symbols that were then available to me, those of Capital and Labour … In fact, I looked around and found that the Capitalists were the people I liked, the “decent” folk with nice manners and pleasant voices, who had me to dinner … They were the people who could afford to read the books I admired … They went to Oxford and to Cambridge, wore good Harris Tweeds … They did the things I liked to do, in fact. How then could I shoot them? … and in any case, the Workers, with whose Cause I had so gratuitously identified myself, would never take me seriously, but would keep calling me “Sir” … when I would have wept for joy to have been called “Comrade”. 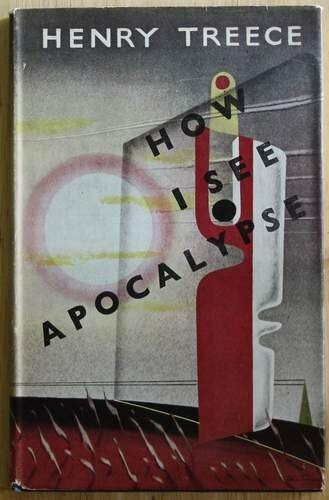 John Tunnard's rather fab cover for Treece's 1946 essay collection. Is the structure abstract? Or is that a pair of eyes at the top and a mouth at the right - the "I see" and "lypse" of the title? Is this the face of Apocalyptic Man? Despite the the tongue in the cheek here, it’s clear that Treece’s espousal of anarchism was in part down to his suspicion that it might involve him in less of this uncomfortable class war business. In his rather trad, rural, William-Morrissey vision of a libertarian society “… the aristocracy would exist as well under anarchism as they have done during any other period of change in this country, provided they were useful and not simply ornamental.” The aristo would be saved from Treece’s firing squad by his “tradition of service to his locality”. Conversely, to be fair, Treece spared no sympathy for the nouveau riche, enjoying wealth and privilege without responsibility, or for the “industrial magnate … who employs 500 wage-slaves for his purely private gain”, of whose enterprise “the final result is, of course, an armaments chain”. The criteria here are to do with Treece’s sense of natural equity, and not primarily with the redistribution of wealth. Although, a little vaguely, he denounced “the capitalist balloon” and advocated “a revised economic system”, he was, as he cheerfully admitted, no kind of economist. The Spanish Civil War had left him untouched. He writes of the “remoteness of the fighting”, making that war for him and others like him merely “something privately Quixotic, a symbol of free action, and a stimulus to free thought”. Remarkably, he admits that though he had “many” Spanish friends, “I did not know on which side they would be fighting”. Two verses later the bards are ambushed (it’s not clear by whom, except that they are grey and black, rather than red and gold), and the poet watches “their gay dead / Ride the gaunt cattle / Back through the wood”. Leaving aside the issue of why the gay dead ride cattle rather than horses – and one suspects that it may be simply to provide a rhyme with “battle”- we can be forgiven for taking this at face value as a bit of rollicking mediaevalism – vaguely like Heath-Stubbs but not so good. But according to Treece’s own commentary: “The Bards are not only the poets, but all the bright souls born into a system which demands of them only blind obedience to the God of Profit Production.” Really?? How Treece expected anyone to detect the anti-capitalism behind the men in tights is hard to say. or hear the miner’s spine crack two miles down. Will be more violent than our eyes can hold. small, local “collectives”, worked by individuals, a new Guild system, not an octopus Trades Unionism; the burial of The State without honours; the dispossession of all Capitalists unwilling to toe the new line. Fairly dissident for someone who served during the war as an Intelligence officer with RAF Bomber Command. 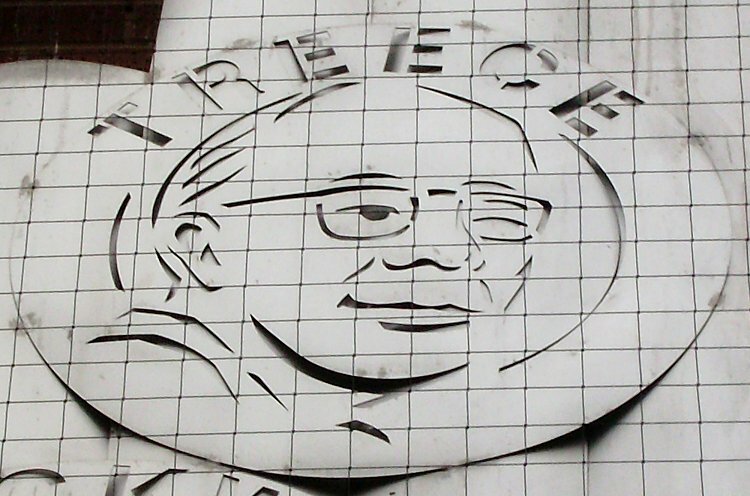 As an anarchist, Treece declares himself for equity and natural law, and against man-made justice and moral law; for the local group, the market town, the market gardener and the small owner, and against the dehumanising central Machine, the industrial city and the industrial magnate; for neighbourly decency and against the profit motive. As an Apocalyptic, he is for the organic and against the decorative or fake, for individual sensitivity and against The Object, for myth and against centralised planning, for William Blake and against Imagism. There is much here that is sympathetic, even if some elements seem a bit new-agey. (The roots of the ‘sixties were definitely in the ‘forties.) Moreover, Treece denounces Surrealism (a considerable influence on early Apocalypticism) as subjecting its followers to the blind and authoritarian demands of the unconscious, in denial of man’s free will to control his circumstances. Given that organised Surrealism allied itself under Breton to purely authoritarian forms of revolutionary theory, and to the relentless historical necessities of Marxism, this is a pretty astute critique. By the early ‘fifties, Treece had had his own change of heart. As he abandoned poetry and turned his hand to the historical novel, the elements of national tradition and laissez faire within his thinking floated to the surface, and he became a firm monarchist and social conservative. The seeds of this conservatism had always been there within his conception of anarchism. Even in his radical years, his views had not been a million miles away from those of a small-government, localist, rural, libertarian Tory. There’s a lesson there somewhere. There are not too many traces left of Treece. Savoy still reprint some of his historical novels, which have been lent a modern legitimacy by the advocacy of fantasy and SF writer Michael Moorcock (another literary anarchist). His only public monument is on the giant metal friezes that adorn the new Morrison’s supermarket at the centre of Wednesbury in the Black Country, his birthplace, and not too far from Walsall, the site of a notoriously rigged anarchist bomb conspiracy trial in 1892. 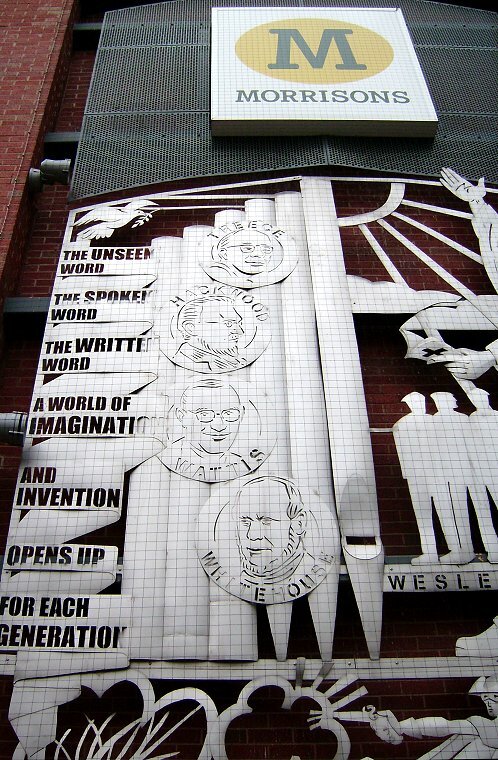 Here his face, taken from a later photo and somewhat simplified in sheet aluminium, winks down at shoppers and passing motorists, above those of local historian Frederick Hackwood, comedy actor Richard Wattis and industrial inventor Cornelius Whitehouse, with accompanying text by Wednesbury’s unofficial poet laureate, Brendan Hawthorne. Treece’s anarchism may have been of a fairly philosophical variety, but there can’t be too many public monuments to anarchists of any kind in the West Midlands, let alone on a supermarket. Though it’s appropriate enough, in its way. In the totalitarian climate of 1943, Personalism must have looked like a radical programme. Today, we’ve all bought into free choice and self-realisation. “Bought” being the operative word. At the supermarket, we are all Personalists. 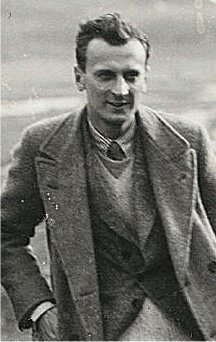 Classified as unfit for active service, the poet and critic Stephen Spender joined the London Auxiliary Fire Service during the war. 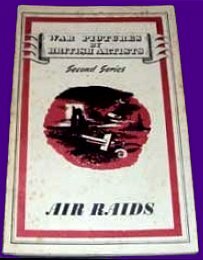 There is some experiential weight, therefore, behind his comments on the effects of the Blitz in his introduction to Air Raids, a 1943 paperback in the Oxford U P’s morale-boosting “War Pictures by British Artists” series. It has taken a Blitz to make crowds of people visit buildings in our cities which they had never noticed, perhaps, until they became, overnight, famous ruins. Tragedy is exalting because it opens up a future, and indeed a present, at the very moment when it destroys past achievements. There is something of release in the destruction of the greatest monuments, and what is released is the spirit which they enshrined. At the same time, there is something dead and inhibiting about a tradition that lives on without being appreciated. It is right that Londoners should have derived a sense of the greatness of Wren’s architecture from the destruction of the city churches. Both live now among the same grim realities … It is important that the artist should hold on to this new certainty of reality, and that the public should not fall asleep again. If the gulf can remain bridged after the war, we may build new cities and a new civilization worthy of the values which we are now spiritually aware of because they have, materially, been destroyed. At one level, we have to give Spender credit for evolving this thesis from his personal experience of fire fighting during the Blitz. At another, he is simply constructing, as he was required to, a positive gloss to put on a destruction whose severity threatened to collapse public morale. And his argument is selective and elitist; beyond the refreshingly thrilling demolition of a couple of Wren city churches, what about the flattening of ordinary homes, and the deaths and mutilations of their inhabitants? What spiritual renewal there? There is, however, another text of the period that, in its own eccentric manner, takes Spender’s argument all the way, finding in the bombing of childhood homes a means of the reintegration of the individual human personality. 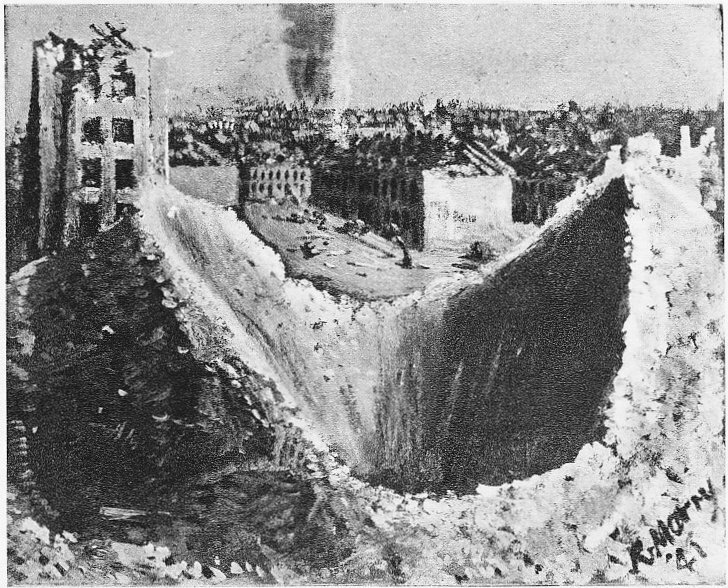 This is Robert Herring’s seven scene “pantomime” of the Blitz, Harlequin Mercutio, published in the first (1943) issue of Transformation, the chunky New Apocalypse periodical edited by Henry Treece and Stefan Schimanski. Herring’s career as a poet and critic has rather dropped out of sight. Born in 1903, he edited the literary periodicals The London Mercury and Life and Letters Today from the ‘twenties to the ‘forties. 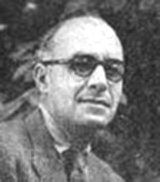 Today he is better remembered as an early film critic involved in experimental cinema through his association with the Pool Group of Kenneth MacPherson and Hilda Doolittle (“HD”), playing a part in MacPherson’s 1930 film Borderline. By 1943 he was no longer in any younger generation, but as the ascendancy of Auden declined he seems to have found a niche among the neo-romantics. He also promoted the Welsh and Scottish poetry “Renaissances” in the pages of his review. 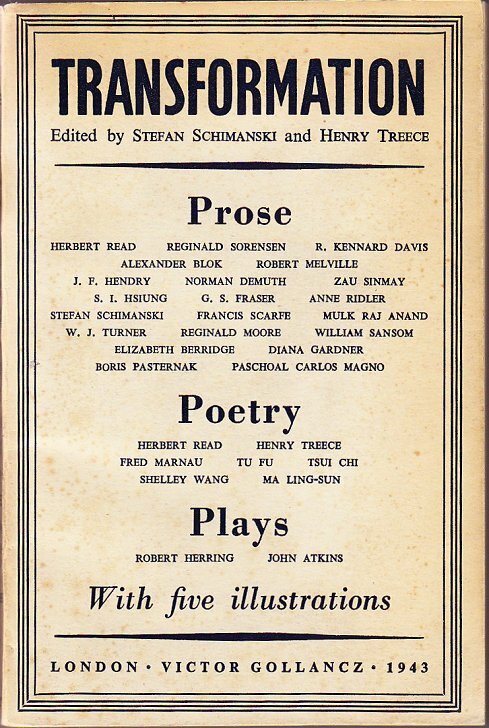 In a dismissive review of Herring’s 1947 Westward Look (selected poems from 1922 to 1945), Derek Stanford characterised Herring’s poetic career as “ ‘a glass of fashion’ in which the chameleon Zeitgeist of verse has left its various passing reflections – an album of poetic ‘poly-photos’ of one’s time. From mock-Elizabethan, via Imagist puns, to the borrowed storm-wrack of ‘Apocalyptic’ song …” Conversely, Apocalyptics Treece and Schimanski applauded Herring for his “individual, kaleidoscopic technique” and as “a playwright completely en rapport with Restoration Drama”. “Cavil but that you’re vulnerable”. (SYNOPSIS – In this pantomime of present-day London, EGO, surveying raid-damage, delves through the rubble that he may find the centre from which to begin again. This delving is both actual, in a journey to past homes, all hit, and spiritual, in a review of his life in them. He is accompanied by HARLEQUIN, his many-faceted mind, and at each site finds something of his Spirit. This is personified by MERCUTIO. MERCUTIO, as in the play, dies, cursing “a plague on both your houses”. His soul is therefore condemned to seek a habitation. 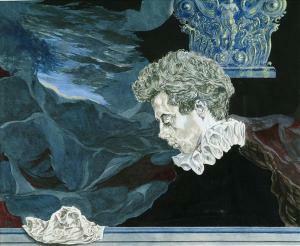 At each site, he is baffled by a figure of HAMLET, who will not face him. It is only when he has learnt to face himself, that MERCUTIO realizes that HAMLET is another aspect of his own self, and that together they form EGO. This unification is presented as their being blown together by a bomb. From the fusion rises HARLEQUIN, le malin, taking his leave and transforming into MERLIN, the magician. “A plague on both your houses,” as he died? the paper pennant, perilous on shaved brick. towers to a town that, flaked, will yet not fall. …Ruins, till only recently, were old. Today, what’s lived in yesterday, lies cold. a maddened minute mashed to lifelong loam. in die-ning room that shuddered out the air. contortioning all ways to draw have from ‘love’. Voidably wed to endless enmity! bombs have made ev’n last resting place be brief. … and what was sealed, is seared; what shut, half-open. may hold its ground, but’s slightly lost its face. flew at the street; burnt them; and made them same. and sable weeds were slashed to Harlequin. our street upended with a new Stonehenge. reach what it takes an earthquake to have freed. 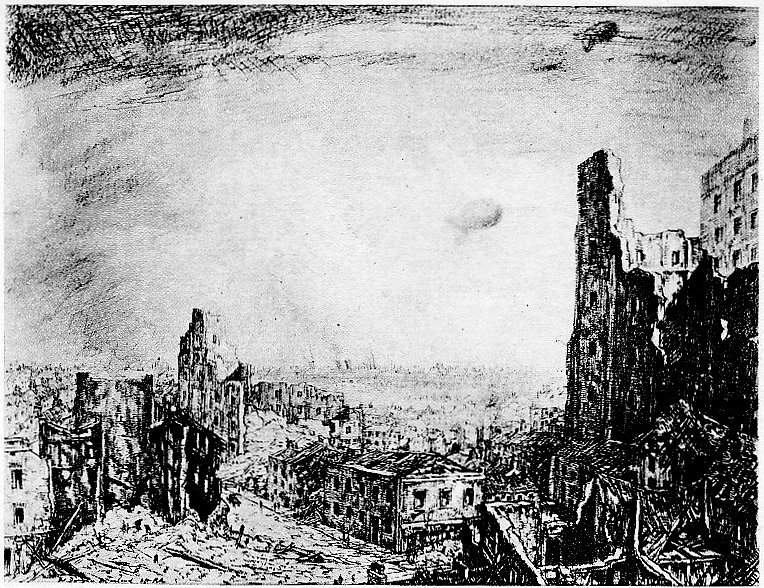 The image of a new Stonehenge created by fragmented slabs of bombed buildings is maybe one of Herring’s happier conceits. And so, in this generalised blaze of optimistic, national-solar symbolism, the play closes. Harlequin Mercutio is hardly a neglected masterpiece, though its clogged Hermetic symbolism, its arcane allusions and its unhelpful antiquarianism are redeemed to an extent by Herring’s vivid and sympathetic narration of Ego’s childhood and family history, which has the feel of being drawn from personal experience. Overall as a text, it is something of a failure, especially given Herring’s understanding of the syntax of film editing, which he might have applied with better effect to this particular script. And it would have benefited had he buried himself less in The Golden Bough, though he was not alone in that indulgence. But the play remains worthy and fascinating for its audacious reclamation of the Blitz as a moment of spiritual rebirth at both psychoanalytic and mythic levels. It belongs within an alternative strand of British modernism that fell out of favour and has since fallen out of view. Whether the strong conservative cultural pull within that strand might, in different circumstances, have given birth to an unpleasant post-war Arthurian nationalism, with a benefit to the political right, is another issue.